The South Korean boy band BTS recently discovered that its youngest member, Jungkook, has a hidden talent. The 60th episode of the act’s web variety series “Run BTS!” aired Tuesday on V Live. On the program, the seven bandmates played a game called “I Am Ground” wearing plush bunny hats with controllable ears. The rules were simple. One player, the “attacker,” calls out another player’s name and a number. The player being attacked raises his rabbit ears that many times in “self-defense,” while maintaining the four-beat rhythm of the game. J-Hope, Jin, V and Suga were the first to be eliminated. The real competition was among Jimin, RM and Jungkook. The trio concentrated hard while pinching the paws dangling from their hats to move their rabbit ears. In the end, it came down to RM versus Jungkook. Jungkook ultimately took the victory with his first attack. “Wow. He’s unbelievable. So good at this,” said RM. The game provided plenty of cute moments for fans -- amazing chances to take screenshots. Watch the latest episode of “Run BTS!” at https://www.vlive.tv/video/109128. 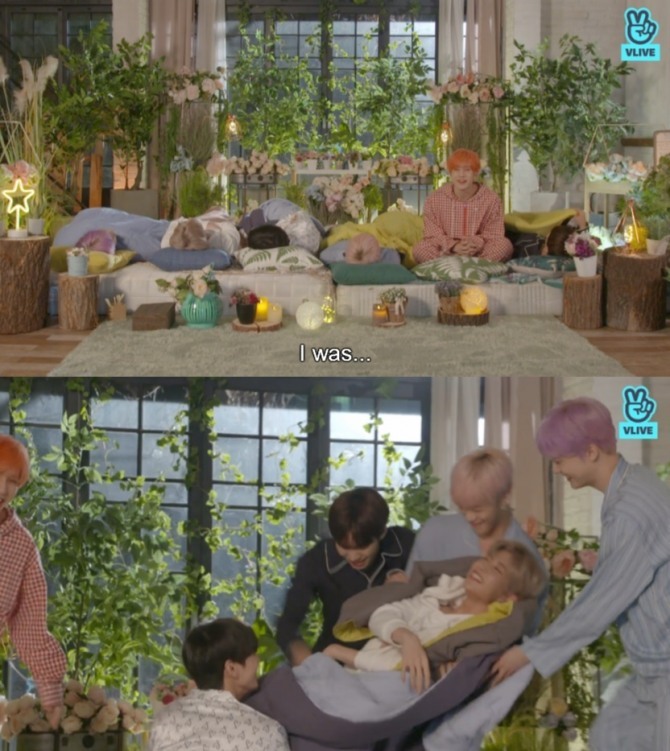 The six-member K-pop boy band Astro appeared on Tuesday’s episode of “Lie V,” V Live’s original program in which celebrities livestream while lying in bed. Rather than a calming and relaxing broadcast, Astro put on a show filled with fun and laughs, with the artists playing games, joking, laughing and singing out loud. In the beginning of the show, the band members took turns talking about their latest album and sharing backstage stories. “This album has tracks with high notes. It gave me a hard time in the recording studio,” Sanha said. Astro released its first full-length album “All Light,” fronted by “All Night,” Jan. 16. Astro’s “Lie V” broadcast can be found here: https://channels.vlive.tv/EF0205/home. 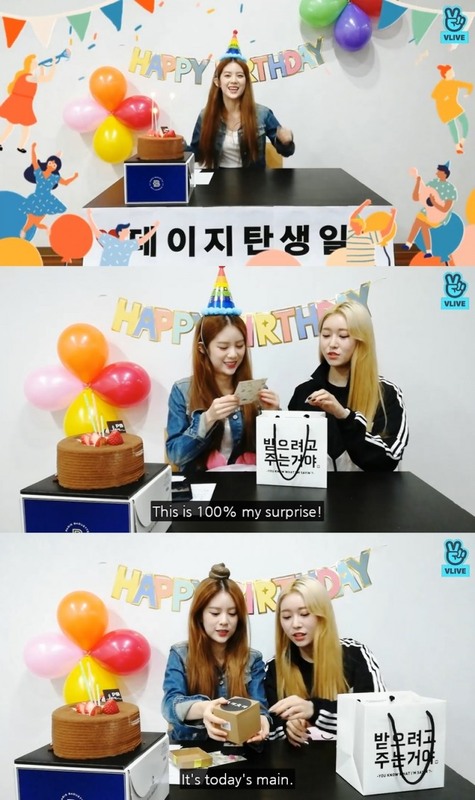 Momoland’s Daisy turned 20 on Tuesday and aired a birthday V Live broadcast in keeping with the band’s tradition. “Today is my birthday! I am 21 years old now,” she said. She is 20 years old by international standards, but the Korean method of calculating ages puts her age at 21. In Korea, a baby is born 1 year old and turns 2 on the first day of the following year. A special guest -- bandmate Jane -- joined Daisy’s birthday livestream, which lasted more than an hour. She brought a nicely wrapped gift for the birthday girl. Daisy couldn’t help laughing when she found a poop toy inside. “You are the first person who has even given me a present like this!” Daisy said between laughs. “This is my first time giving someone something like this,” Jane responded. Watch Daisy’s birthday broadcast at https://www.vlive.tv/video/109929.